It’s been over 150 days since I left the U.S. this round. It’ll be around 180 by the time I set foot on U.S. soil again in a month. But this time I have a return flight back to Guatemala, so this trip is actually just a visit. It’s the first round trip flight I’ve bought since Christmas 2013. That’s been quite a thing to wrap my head around. Of the time I’ve been abroad, it’s been over 100 days since I arrived in Antigua. I always knew this phase of Travel Abrodge would be different, but I think with 65% of my time being spent in one place it’s safe to call it my expat phase. Expat life is very different from travel life. I still consider myself a traveler, but I now have ties to somewhere that I haven’t had in years. I can recommend the best weekend activities, the locals’ favorite beers, nightlife according to your mood instead of the hostel flyers, and hidden gems for cheap eats that aren’t mentioned in Lonely Planet. Things that I searched for and thrived on when living in San Francisco and NYC are popping up again here. And this time I’m finding myself in a better position to share that knowledge – as a bartender. When I work at the little front bar at Cafe No Se I am not just someone pouring drinks, I am a visitor’s guide to Antigua. Where can I get a quesadilla? Where can I dance on a Saturday night? Is the volcano hike worth it? The amount of questions I am asked about this town multiplies every night I work, and I am happy to actually know the answers. When I’m not at work, when I’m just going about my daily life in town, or when I’m walking the dogs, I have places I want to return to or test out for the first time or just stop into for an errand. And on the way I run into people I know. Small town Antigua is like living on Nob Hill again – impossible to venture outside without saying hi to someone. I went to brunch with a group of girls friends on Sunday. I’m going to the beach with all the Lucky bartenders for two days next week. These are things that I used to do regularly before traveling, and they’re back in my life now just in a different place with different people. It’s the things that I missed back in October when I started to think about settling down somewhere for a bit. I realize it’s been a while since I wrote anything. But that’s the thing about a travel blog – when you stop traveling, what else do you write about? A while back I posted that I had decided to stay in Antigua, so that’s what I’ve been doing lately. Living here. So what’s that like? Pretty great. In December I moved into a house with three friends and three puppies. That means I have to pay rent. Coming from the States I was a bit in shock how much we could get here for so little money. Two-story house, fully furnished (and not just beds and couches, but towels, dishes, even a coffee maker), two car garage with washer/dryer, all utilities included plus cleaning twice a week, in a gated community a 15-minute walk from Central Park. Sounds expensive right? US$900. Split between 4 of us, that’s US$225 each. I can almost hear all of you packing your belongings and booking flights to move here too. I did the math and with what I still had allotted for hostel accommodations through the end of March I could actually live in Antigua and do nothing but hang out. That’s sounds boring though. And if I am going to stay somewhere for so long, then I should take advantage to work and save money so I can keep going again later, like I did this summer in Vermont. So I got two jobs. I have always had an interest in bartending but never was in a place to explore it. Now seemed as good a time as any. First I started working at the bar that had welcomed me with open arms from my first night in town, the people I am happy to call my Antigua family: Lucky Rabbit. It also happens to be one of the biggest parties in town on a Saturday night, hands down my favorite night to work there. Lucky Rabbit is a big part of my life here, I owe it a lot. I started over the holidays, working long nights on Christmas Eve and New Years Eve. Antigua was overrun with tourists and locals alike, meaning I was thrown into the chaos of a popular bar during vacation time. It was one hell of a way to learn. But I thrived on the excitement, the adrenaline, the pure fun of being behind the bar. I quickly moved from last-minute fill in to scheduled employee. I picked up a second bartending gig at the end of January at Cafe No Se. It is the polar opposite of Lucky but it matches the other side of my personality. No Se is the kind of bar I would seek out in San Francisco. 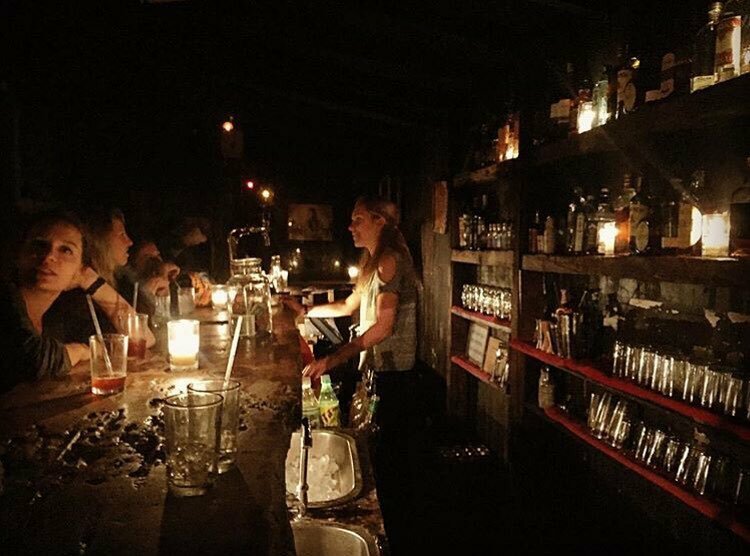 It is a candlelit mezcal bar with live music every night and a rotating cast of characters that share life stories and philosophical idioms for hours over dark beers and shots of Joven. It’s also an expat haven, which is a nice complement to the mostly Guatemalan staff at Lucky. Between the two bars I feel like I get to experience both sides of town and of myself. It’s working great. Otherwise I just live daily life like you would anywhere else. Well, maybe not exactly like anywhere else. When I go grocery shopping it isn’t to a supermarket but at the local market, where vegetables are piled up on wood tables and meat hangs in tile stalls. When I go clothes shopping it’s at the same market but in the back clothes section, and it’s mostly second-hand items and tables of 2 or 3 Q bargains. But I still cook meals at home (or more accurately Brayan cooks and I open the wine) and celebrate nights off by going out with the girls. And now when I walk around Antigua I run into people I know all over the place. It’s becoming home. Home in Guatemala. I guess this means my travel blog is now an expat blog, tales of living abroad. Maybe I should change it from TravelAbrodge to LivingAbrodge. Thoughts?